Primaries on 15th March 2016 – which news publishers win the News Boxes? Hillary Clinton and Donald Trump are the clear winners of the primaries on March 15th. In five states, the delegates cast their votes for their favourite presidential candidate. Most of the interested public specifically watched Ohio and Florida – the “The winner takes it all” states. John Kasich was able to score his first win in Ohio. In Florida though, home of Marco Rubio, Donald Trump won. As a result, Rubio declared his campaign closed. Clinton won for the democrats in Ohio and Florida, in Florida very clearly with 65 percent. Clinton and Trump are also leading in the other states (even though partly only marginally). Nytimes.com, cnn.com and fivethirtyeight.com win the Google News Boxes. Nytimes.com, fivethirtyeight.com and cnn.com dominate the Google News Boxes. Nytimes.com marks the first place with an average visibility of 12.16 percent, fivethirtyeight.com is on the second place with a visibility of 8.25 percent, and cnn.com is on the third place with 8.01 percent. They were thus represented the most in the Google News Boxes for the keywords of the above mentioned set of keywords. 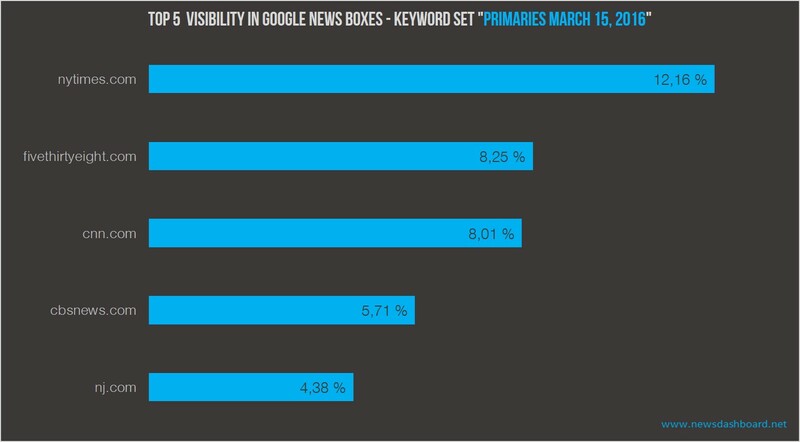 Furthermore, cbsnews.com and nj.com are in the top 5 of the Google News Boxes around the primaries on 15th March 2016. It doesn’t come as a big surprise that nytimes.com, fivethirtyeight.com and cnn.com are that successful in the Google News Boxes. We just have to take a look at the results of former analyses of the Trisolute Software News Dashboard data. Those three news publishers were already high up in the top five on Super Tuesday on 1st March; back then, only the order was different: cnn.com was on the first place, nytimes.com on the second place, and fivethirtyeight.com was on the third (“Democratic” keyword set) respectively fourth place (“Republican” keyword set). Cnn.com and nytimes.com also dominated the News Boxes during the election in Michigan, and fivethirtyeight.com was also present. Let’s now look at the Google News Boxes for the individual candidates. Who was able to win the most wanted places in the Google News Boxes, and when? We start with the Democrats’ winner: “Hillary Clinton”. The following chart shows, that there isn’t a clear winner among the news publishers. Instead we see a huge fluctuation on the first three News Box positions. Five news publishers in total hold the first position of the Google News Box for “Hillary Clinton” for a bigger amount of time: cnn.com and nytimes.com are on the first place for some time each during the night; nbcnews.com conquers the pole position during early morning; at noon there is yahoo.com, and foxnews.com during the early evening. 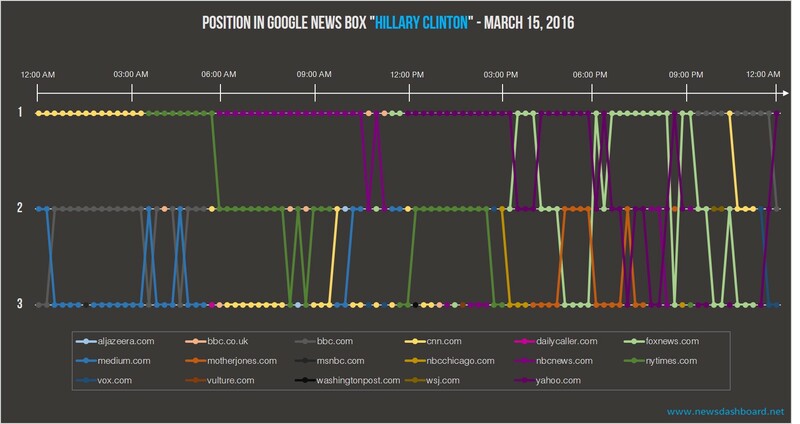 Many News Publishers are in the Google News Box “Hillary Clinton”. In the News Box for “Bernie Sanders”, there are clear winners: During the night and until morning, cnn.com is leading; during the afternoon until early evening fivethirtyeight.com. Only afterwards do several news publishers alternate on place 1 of the News Box, like foxnews.com and rollingstone.com. The letter appears surprising at first glance and in the context of primary elections since the Rolling Stone mainly deals with musical topics. Politics and sports do play a role on the site though, and the site has been covering Bernie Sanders for a while. 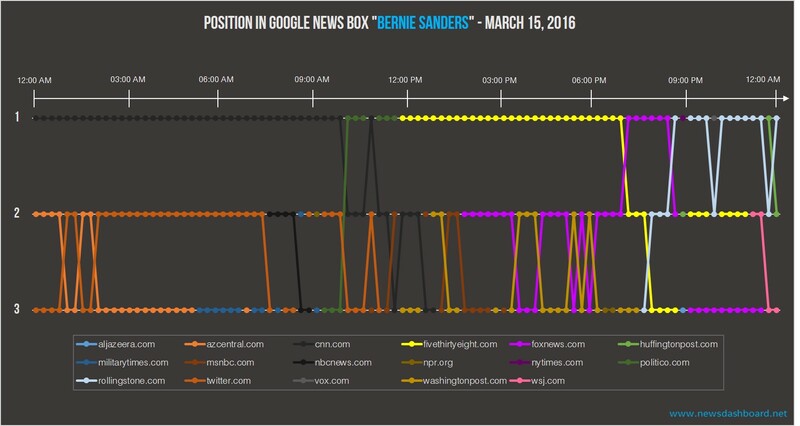 Cnn.com and fivethirtyeight.com dominate the “Bernie Sanders” Google News Box. Furthermore it is striking that short message service Twitter ranks in the Google News Box for “Bernie Sanders” quite often. It is thus not a tweet by Bernie Sanders himself, which would have been the most logical assumption, since Google offers several options for the candidates to rank prominently in the search results. For “Donald Trump”, nytimes.com is the clear winner. The online appearance of the New York Times appears almost constantly in the News Box – most of the time on position 1, otherwise on position 2 or 3. At night between 10:30 p.m. and 11:30 p.m., nytimes.com appears with even two posts in the News Box. We only depict the highest number in the charts (i.e. place 1) – therefore you will not see it in the chart at a first glance. If you look into the data behind the chart though, you’ll see that nytimes.com double-ranks in the News Box during this time. 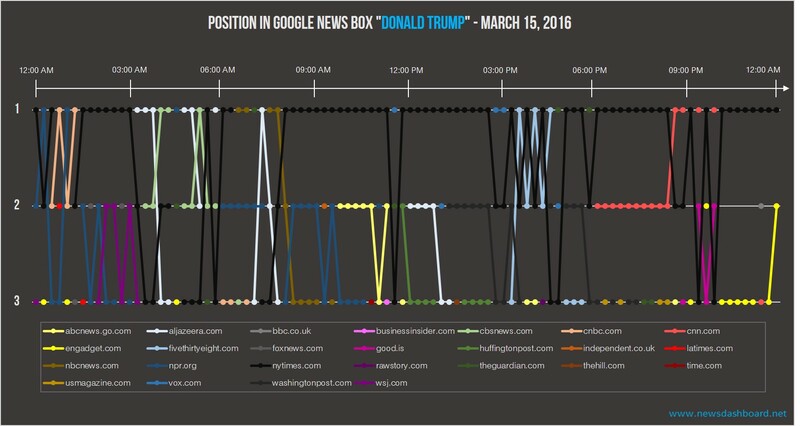 Nytimes.com is the winner of the “Donald Trump” Google News Box. John Kasich won in his home state Ohio and scores his first victory for the preliminary elections. It is a bit surprising, that his Google News Box was won by Aljazeera.com. The site holds position 1 in the News Box during most of the day. Only in the evening, around 6 p.m., aljazeera.com gets replaced by other news publishers like marketwatch.com, cnn.com or cbsnews.com. Nytimes.com, which is usually strong in the Google News Boxes, is on the second or third position only every now and then. 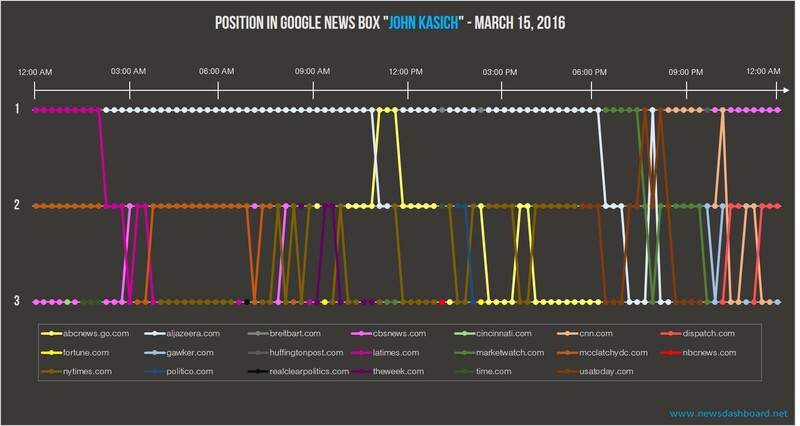 aljazeera.com was on pole position in the “John Kasich” Google News Box. Let’s now get to the loser of the primaries on 15th March 2016. Marcio Rubio: he was not able to prevail over Donald Trump in his home state Florida – he took the consequences and resigns from campaigning. cnn.com is the winner of the Google News Box of “Marco Rubio”. 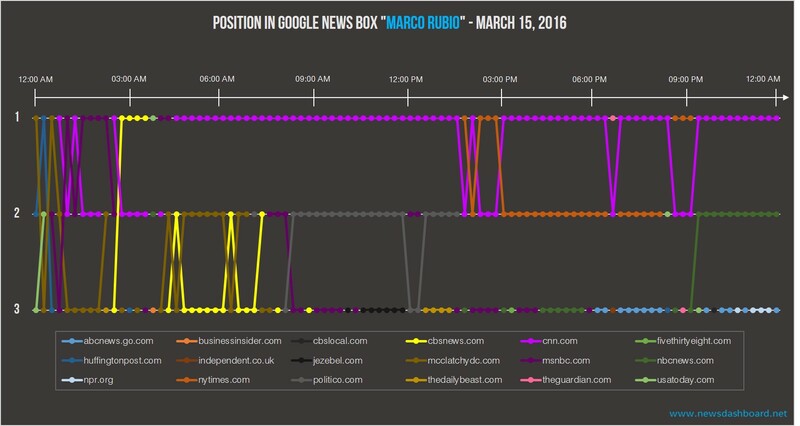 In the Google News Box for “Marcio Rubio”, there was a clear winner though: cnn.com was on position 1 most of the day. There was more variation on the second place. There, mcclatchydc.com, politico.com, nytimes.com and nbcnews.com ranked in the News Box for some time. In summary it can be said that nytimes.com, cnn.com and fivethirtyeight.com are the clear winners considering all keywords of the second Super Tuesday with primaries in Ohio, Florida, North Carolina, Missouri and Illinois. This also applies to all the other sets of keywords for the presidential candidates and the preliminary elections that we analysed so far: Those three news publisher seem to have a specifically high trust in Google News when it comes to the presidential elections. Other news publishers are able to surprise, too, as the detailed views of the Google News Boxes for the individual candidates showed. Aljazeera.com won the News Box for “John Kasich” for example. For “Hillary Clinton”, different other news publishers were able to prevail, like nbcnews.com, yahoo.com and foxnews.com.